Safe Democracy Foundation » Blog Archive » The Iberian-American Summits: Is the glass half full or half empty? The Iberian-American Summits: Is the glass half full or half empty? What are the reasons for holding the Iberian-American summits? And for not holding them. Where does the skepticism come from? 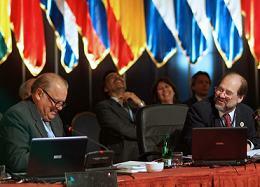 What was expected of Summit XVII in Santiago de Chile? Are these Summits justified? The Parallel Summit. The importance of face-to-face meetings. The debate about institutional quality in Latin America. Next, the first part of the analysis. (From Santiago de Chile. This analysis was written before the Iberian-American Summit in Santiago de Chile) WHAT IS THE POINT? The truth is that a look of skepticism appears on the faces of the common people every time the word Summit is mentioned. This is because it has been ingrained in their minds that summits are not very relevant in deciding anything in the citizens’ daily lives, and that they should not hope for many practical results. In other words, that this is fundamentally an event for the authorities and of interest to the media and analysts, and giant traffic jams for the cities that host them. In reality this is only a partial view. Even if it is true that there is no real debate (the final declaration is consensual and discussed by advisors and the respective Secretaries of Foreign Affairs) they fulfill valuable practical objectives. I will point out at least two. In the first place, they allow for face-to-face bilateral meetings, most importantly when the relations between the countries are going through a complicated period. In the case of Chile, Ricardo Lagos pointed out that in his six years governing his country he met six Bolivian leaders and held great face-to-face international meetings, including two Iberian-American summits, with five of them. The same can be said about Argentina and Uruguay during their pulp mill conflict, even though more than once Néstor Kirchner was not present at these meetings. Secondly, it allows for new leaders to be shown to the public for the first time, as is the case with Cristina Fernández, who will hold a stand-out position and be received as President-elect. WHERE DOES THE SKEPTICISM COME FROM? Besides the objective fact that these summits are full of general declarations about such topics as democracy and poverty, there is no true will to follow through with the agreements. There are two obvious examples of this, the first being Summit VI in 1996 in Viña del Mar (Chile) where all of the countries, including Cuba, signed an agreement that committed them to having free and democratic elections along with freedom of expression and conscience. Another example is that of Spain, a country that has twice signed declarations dealing with the reunification of families and the permanency of immigrants. “Latin America has less and less presence at the international level, a reason to be in favor of these Summits”Secondly, Latin America has less and less presence at the international level (a reason to be in favor of these Summits), and the distance between contrary courses of internal development and international policy existent in the region is constantly growing greater. For their own part, the future of both Spain and Portugal is firmly rooted in Europe and not in their colonial pasts. This was made very obvious during the preparation of the Declaration of Summit XIV in San José (Costa Rica), where both countries made it known that they could not sign some paragraphs of the treaty, given that they contradicted some of their commitments to the European Union. Thirdly, it was accepted that one of the problems of the Summits was that there was no continuity from meeting to meeting. Because of this, the Department of Iberian-American Cooperation was created in 1999, but in view of its exclusively bureaucratic function it was replaced by a body that hopes to have more relevance, like the current General Iberian-American Department. Enrique Iglesias, a Uruguayan of Spanish origin with ample experience as the ex-General Secretary of the United Nations’ Economic Commission for Latin America (CEPAL in its Spanish initials), and above all as ex-President of the Inter-American Development Bank (BID in its Spanish initials), was put at the head of this body. However, the expectations for this body have been becoming diluted before such declarations as an Iberian-American Secretary General must respect its governments and this means that he cannot judge them, which gives the feeling that this is simply more of the same. WHAT IS EXPECTED OF SUMMIT XVII IN SANTIAGO? The current Summit XVII is called Social cohesion and policies to achieve more inclusive societies in Iberia-America, probably as an allusion to the appearance of indigenous people and women as elected Heads of State, even though the social topic has been dealt with at several other Summits, with this one in particular having been present in several prior declarations. Case in point is that the Summit in 2003 in Bolivia was called Social inclusion, the motor of development of the Iberian-American community. First of all, a great number of people are expected to attend, not only the King of Spain but also Heads of State and Government, so that Santiago be different than the Summit in 2006 in Montevideo, which was the Summit of absences due to the poor participation of the most important leaders. Secondly, to compensate the citizens somewhat for the disturbances and to give them the sensation that they are participating, this Summit is going to take place in six cities and on a ship, in addition to cultural and artistic embassies, where the events will be shown for free. Thirdly, it is hoped that Spain, in a role solicited by both countries, advance with its offer of rapprochement between Uruguay and Argentina, necessary because of their disagreement regarding the pulp mills. Fourthly, there will be a behind-closed-doors meeting between the Heads of State and Government. Fifthly, a fiscal reform to increase social resources to the State will be proposed at this meeting, but it will also be insisted that that this reform be carried out by means of a social pact. Critical voices have already pointed out that greater but inefficient resources in corrupt conditions do not resolve any problems. For an example of this, we only need to observe this period of exceptional income that some countries have experienced as a result of the international increase in the price of raw and hydrocarbon materials. Sixthly, the most important thing that is hoped to be achieved is the signing of a type of Latin American social security convention. The Secretaries of Work have already signed it, and the heads of government and then the Parliaments must approve it. All of this adds up to an integrated system between the 22 countries that will allow the people to retire with the contributions that they have made in the other countries, which will not cease to be important in a region with several million immigrants. Seventhly, there will continue to be discussion concerning the incorporation of other countries that were at one point Spanish or Portuguese colonies, in Africa and Asia, in addition to other countries from the region that, like Belize, have another colonial origin but are very culturally and physically integrated with their Spanish-speaking neighbors. Of course, such a decision could be dangerous, given that it would remove the sense of communion and brotherhood that gave rise to the institution. Lastly, Hugo Chavez’s Venezuela will once again garner more media attention than the King of Spain, due more than anything to the proximity of Venezuela’s referendum. There is no doubt that Chávez has been replacing Fidel Castro (Cuba is going to be represented by its vice president Carlos Lage), as the figure of greatest interest to the press (in fact in the very same place at the previous Summit in Chile in 1996, there were physical protests in favor of and against Castro, one day apart). However, with this opportunity Cristina Fernández will demonstrate strong competence, given that many eyes will be focused on her, not only for her attractive policy, but also to see if the changes in Argentina’s international relations are simply formal or something substantial. There is no doubt that this organization would not exist without Spain, not only for its economic weight as an investor and for declaring itself the bridge between Latin America and the European Union, but also for financing 60 percent of what is spent from summit to summit and several of the previous meetings of the Heads of State and government, as there are many meetings between the Cabinets. Above all, Spain assembled the first summit in 1991 in Guadalajara, Mexico. The reason was to commemorate the 500 years since the arrival of Columbus (although Brazil did it years later, given that it considers Vasco da Gama the founding milestone). Regarding the debate of that time period of whether Spain was the common origin (the positive), or the opposite view of it having been the cause of the death and destruction of the native cultures (the negative), Spain accepted the historian Leopoldo Castedo’s thesis of the meeting of two cultures, and the King invited everyone to a meeting under this demonstration of good will. However, what should have been occasional, spaced-out meetings to ensure that each one be truly important and useful, was transformed into an annual ritual, often with no strong reasons to meet aside from the very important one of the leaders getting to know each other on a personal level. In all there are 22 countries that share a common history, language and culture, including three European ones (little Andorra was incorporated in 2004), but have changed a great deal in political and economic terms since 1991. Essentially, with the exception of Cuba, the majority of the Latin American countries appeared to have similar political and economic plans, centered on representative democracy and globalization. Since then, strong criticism of this route, which didn’t seem to be yielding results, arose, and Venezuela, Bolivia, Ecuador and Nicaragua took different paths, in addition to other countries that elected governments strongly critical of what predominated in the past decade. Lastly, the election of the word Summit for these types of meetings constitutes another problem, given that the word has its roots in extremely important meetings such as those between the Allies during the Second World War: Stalin, Churchill and Roosevelt, or the Soviet and Russian leaders during the Cold War, where relevant decisions were made. Henceforth, it seems like an exaggeration to use the word for routine meetings in which nothing crucial is decided. Like with all international meetings, it is possible that those organized by social groups, in the majority leftist and critical of globalization, a common factor in all international meetings, be well-informed. Thus, the 2007 Summit for the Friendship and Integration of the Iberian-American Pueblos will be developed in parallel to the official summit. In total, 8 countries and 7 heads of State have been invited (Castro will be represented). Morales and Chávez have already confirmed that they will attend, and as an indication of the different profile (as her advisors say) that she attempts to project, Cristina Fernández has excused herself. In any case, as an expression of political changes in the region, given the fact that these organizations are very close to several governments, what was originally the alternative summit has come to be one that is simply parallel. These meetings will have little benefit for Latin America as long as it is not understood that the region’s great problem is the lack of results from the processes of integration, aside from the instability of the institutions, the existence of caudillos, growing mistrust, and the lack of State reform and its inefficiency. In other words, Latin America will not take advantage of this bridge to Europe as long as it is not proposed that its challenge is above all what I call the Quality of its Democracy, meaning public decisions that benefit instead of harm its people.